Coming on the heels of the iRig Keys Mini I was pleased to receive the iRig Pads controller to take for a spin. While a keyboard controller will work in most performance and composing situations there are times you might need a different way to capture your ideas. This is where the iRig Pads come in. When you first take the iRig Pads out of their box you may be a little shocked by the small size and compact nature of the device. I am so impressed by the way IK Multimedia packages their products. They go the extra mile when selecting materials and presentation so your initial experience is always a good one. Taking the iRig Pads out I was very pleased with how they felt. The form factor did not overwhelm and the device was very easy to handle. I was also impressed with the overall build quality, it felt very solid. The pads themselves had a nice rugged feel to them as to give the idea that they could hold up well to lots of use. The attention to detail shines through in some of the little touches in the design. The pads have a really nice LED backlight where the color corresponds to the velocity level. The visual cues are fun and informative and if you are performing in a darkened area it can really produce some cool lighting effects. Along with the pads you have several assignable controls. These are in the form of some rotary, push button and an interesting slide/fader control. The iRig Pads also provide an expression pedal input on the rear of the device which can further expand on the performance and control possibilities. 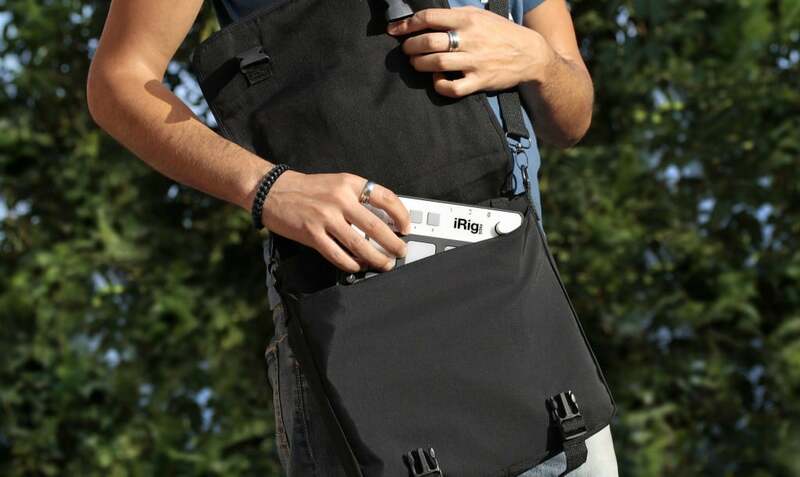 Since the iRig Pads are so portable they fit right in to most musicians gear bag. Another bonus is they are powered by the USB/Lightning interface there is no need for an additional adapter. 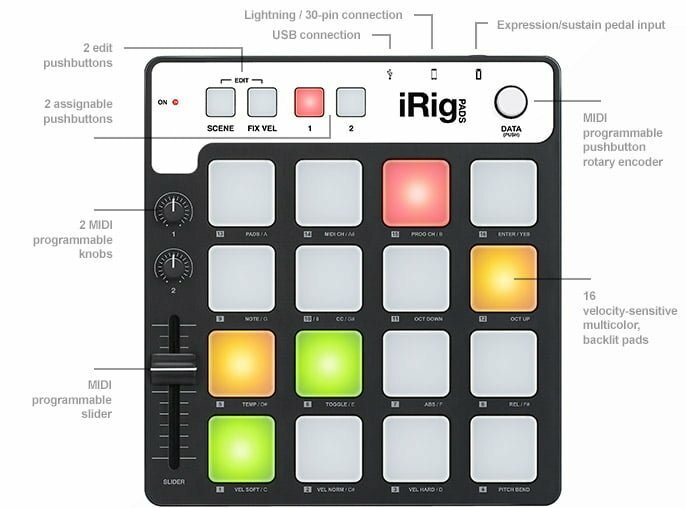 Speaking of the Lightning connector the iRig pads follow IK Multimedia’s lead in providing direct connections to your iOS devices. You are presented with several options to work with a variety of devices. You can use your iRig Pads with not only iOS but Android, PC and Mac as well. Having this flexibility allows you to get the most out of this compact controller. IK Multimedia provides many fun music and performance apps such as their signature SampleTank virtual instrument along with their more beat and DJ oriented apps Groovemaker and DJ Rig, but the fun does not stop there. 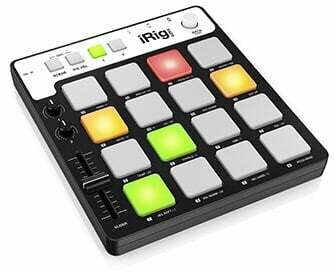 You can also use the iRig Pads with your Windows or Mac based music production software. I am looking forward to trying them out with my MacBook Pro and Ableton Live 9. What makes the iRig Pads even more powerful and flexible is the ability to edit the functions of the buttons, pads, knobs and sliders. 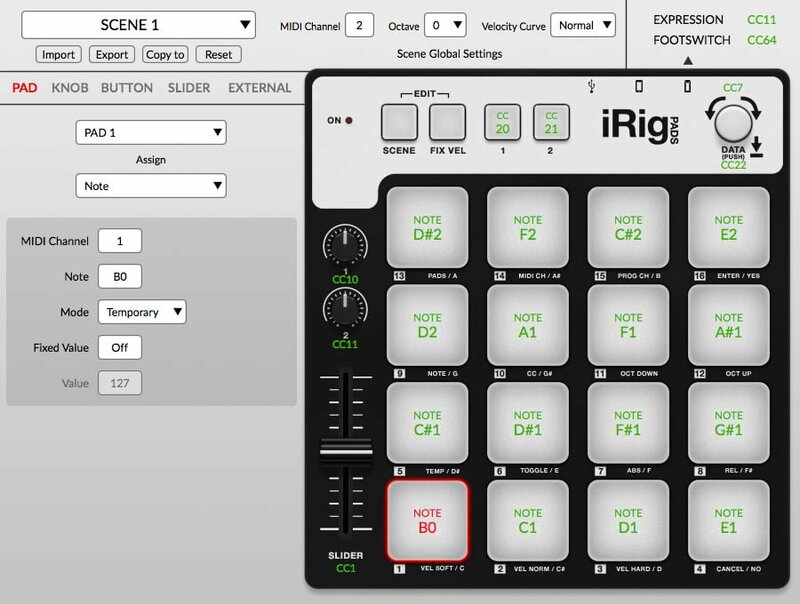 You do this by downloading the iRig Pads Editor app for your specific computing platform. There you have control over customizing and saving various functions and scenes to tailor the iRig Pads to your specific use. The iRig Pads are a great addition to any composers setup. This is especially true if your specialty is working with more beat and grid oriented types of music and composition. Just a little warning, once you get started playing around with the iRig Pads you might not want to stop. 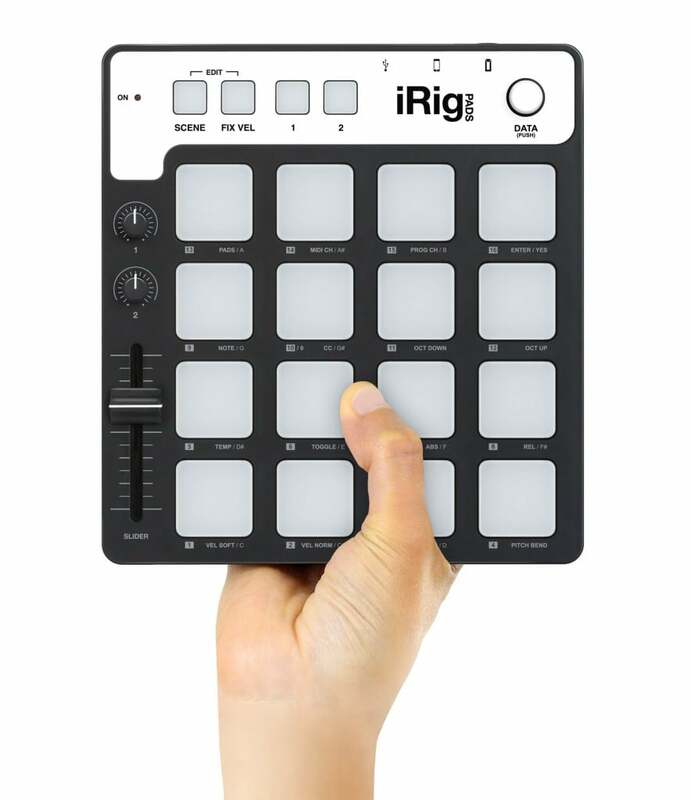 The iRig Pads are available now and retail for $149.00. For more information please visit IK Multimedias website.